There is a beautiful and serene retreat in the Cherry Grove section of North Myrtle Beach, South Carolina known as Raintree Villas. This North Myrtle Beach resort is directly on the oceanfront and each of its North Myrtle Beach rentals has perfect oceanfront views from its private balcony. You will fall in love with the oceanfront vistas, the peace and quiet, and the close proximity of this North Myrtle Beach resort to everything you want to see and do during your North Myrtle Beach vacation. Raintree Villas is not a large North Myrtle Beach resort. It is comprised of two buildings that are only three stories each. This North Myrtle Beach resort is built on stilts which allows for covered parking on the ground level. Between the two oceanfront buildings are a sparkling swimming blue and an inviting sun deck. The North Myrtle Beach condos of Raintree Villas and the swimming pool all overlook the tranquil dune line that s filled with sea oats. Follow the path from the pool area through the dunes and out to the white sandy beaches. Having the beach in your backyard is more than convenient. It is luxurious. Your North Myrtle Beach vacation will be incredible because from your North Myrtle Beach condo rental you will only be steps away from swimming in the ocean. Play on the beachfront and build sand castles with the kids. You can take long walks at sunrise and sunset and admire the views all the while. Comb the beach for seashells during your North Myrtle Beach vacation and walk towards the nearby fishing pier. Enjoy every aspect of having the Atlantic Ocean so closely located to your private North Myrtle Beach vacation rental. The North Myrtle Beach condominium rentals at Raintree Villas are nicely decorated. The welcoming interiors make you feel right at home and the space is bathed in sunlight from the sliding glass door that leads to the private balcony. Choose a spacious two-bedroom North Myrtle Beach vacation rental at Raintree Villas. They are large enough to accommodate six people with the sleeper sofa in the living room. These two-bedroom condos in North Myrtle Beach, South Carolina have two full baths for your convenience, too. Enter these North Myrtle Beach rentals through the front door that is next to the kitchen. Full-size appliances in the kitchens at Raintree Villas include a dishwasher. Make popcorn in the microwave. Brew fresh coffee in the coffee maker. Make a whole meal for your family with the stove and oven that are provided and keep your soft drinks and juice ice cold in the refrigerator. With such a well equipped kitchen you can easily keep snacks on hand and even cook a hot breakfast during your North Myrtle Beach vacation at Raintree Villas. 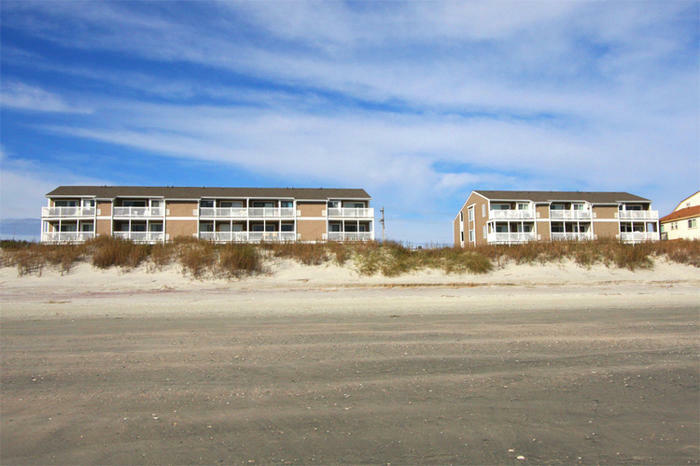 Elliott Beach Rentals is not affiliated with onsite management or the HOA of Raintree Villas.